Send, for example, a newsletter to your customers to develop their loyalty, give them a coupon to thank them for their order, or insert advertising banners on your shop to make it livelier. Advertising & Marketing There are 37 products. Tired of complex GDPR rules and requirements? Cookiebot have made one part of the GDPR simple - cookies and online tracking. Cookiebot makes your cookies and online tracking GDPR compliant with just a module. 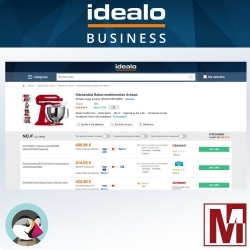 This module will allow you to integrate in your PrestaShop shop the pixel tracking script proposed by the IDEALO price comparison. 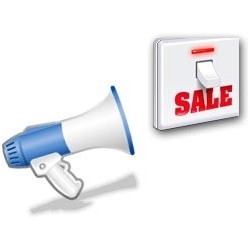 All you have to do is enter your script ID in the module configuration so that all sales data are sent to IDEALO. 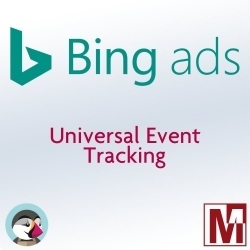 This free module will allow you to quickly install the Universal Conversion Tracking offered by the Bing Ads service on your PrestaShop store. This conversion tracking is essential for users of the advertising network proposed by Bing. 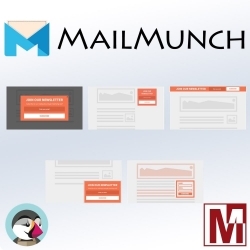 Grow Your Email List MailMunch captures leads from your website and converts visitors into email subscribers and customers. 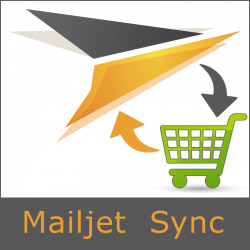 This free module will help you to easily integrate MailMunch into your PrestaShop store. 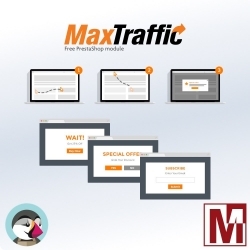 Easily insert the MaxTraffic code on your PrestaShop to set up a Intent Exit Pop-Ups Turn Your Leaving Visitors Into Customers. 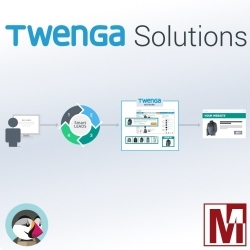 If you have adopted Twenga solution and have your shop developed with PrestaShop Twenga then sent you a beautiful Smart Tracker script to include on your site. Integrate this script in seconds with this module. This unique module in the PrestaShop world, will help you to commercially develop your shop using tools dedicated to the improvement of your reputation. 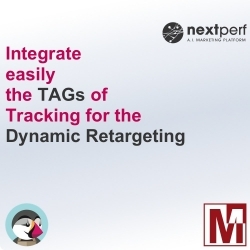 After you ordered a campaign from NextPerf solution, you don't know how to integrate tracking TAGs in your PrestaShop store ? This module is for you with a simply solution to integrate all NextPerf TAGs on your shop. 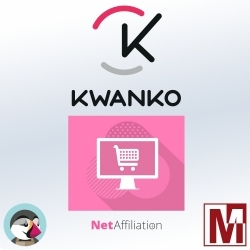 After you ordered a campaign from NetAffiliation's Kwanko solution, you don't know how to integrate tracking TAGs in your PrestaShop store ? This module is for you with a simply solution to integrate all NetAffiliation TAGs on your shop. 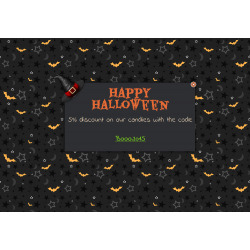 This module allows you displays a message to your visitors in the halloween way. The purpose of this module is to create discount vouchers when a customer adds a comment on a product. You can create several conditions to create various vouchers according to the comment, to the customer or to the product. Vouchers can be sent to the customers by email. Zopim offers its new integration code and we, we adapt by offering a new and more comprehensive method of Zopim on Prestashop integration. You can now customize your Zopim window on each shop or you install it, regardless the configuration is made in the dashboard of Zopim. Build customer loyalty! 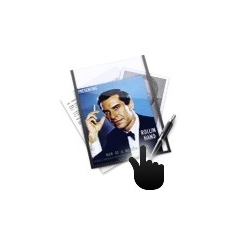 When a customer uses partially his vouchers, this module creates a new voucher with the remaining amount and he receives a mail with the code to put in his cart for his next order. 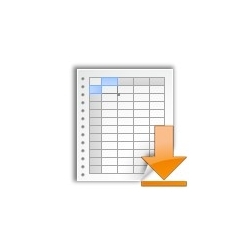 This module allows your customers to download your catalog in CSV format. Perfect for dropshipping or partners. 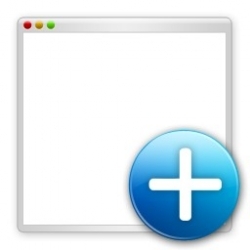 This module allow you to display an alternative image when your customer mouse go over a product list or home featured. 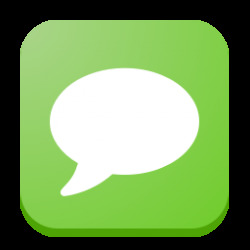 Image upload is in the backoffice catalog on the image tab wihout refresh the page. Full documentation and installation in english / french. 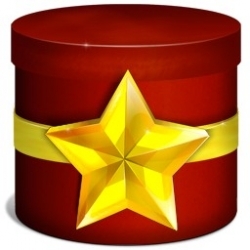 This module creates a coupon when a customer bought a certain amount in one or more times. You can create multiple levels that will create different vouchers. 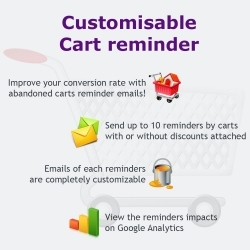 Followup with your customers on abandoned carts by sending them reminder emails, include coupons and discounts, and bring them back to your site to complete the purchase. 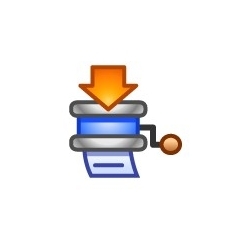 This abandoned cart module improves conversion rate and decreases cart abandonment. This module is tightly integrated with Prestashop to assist you in submitting your ads or to keep in touch with your customers. 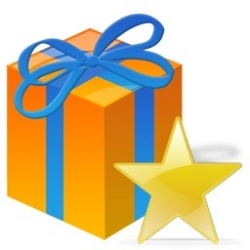 When an order is confirmed, this module creates a voucher based on the amount. You can define as many conditions as you want to calculate the amount of the coupon. This is also configurable as coupons created by hand in PrestaShop. In e-commerce, there is a golden rule: to be close to its customers. We must therefore find gimmicks to always give that impression by communicating betterwith its customers. 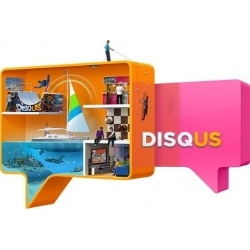 Integrate DISQUS comments system to your web-store. 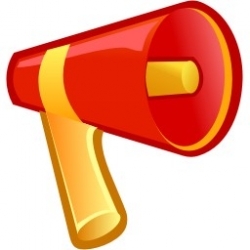 SEO-friendly comments box to all Products and CMS Pages.